PLAYOFFS? YOU KIDDING ME? PLAYOFFS? Yes, boys and girls, it’s finally here. 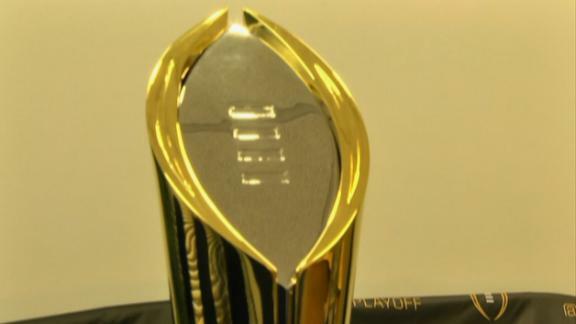 For the first time in the history of college football, we now have a playoff system. I believe it should be expanded to 8 teams, but I’ll take what I can get for now. So now that we have this playoff system, what will it look like. Well, my crystal ball is still in the shop. Who last year saw Missouri and Auburn playing for the SEC championship in 2013? However, I will do my best to look at the Power Five conferences and talk about what teams could possibly make the fantastic four. SEC – The SEC is still the 800 pound gorilla in college football. I think the Pac-12 is catching up, but until they can actually win a championship, they are still #2 at best. The SEC West could once again come down to the Iron Bowl between Alabama and Auburn. Since AJ McCarron is now a Cincinnati Bengal, the Crimson Tide’s success will largely depend on finding his successor. Most people think it will be Florida State transfer Jacob Coker. Coker was beaten out by Heisman Trophy winner Jameis Winston, so he transferred. Another possibility is athletic senior Blake Sims which would add a different dimension to the offense. Alabama is loaded with talent, so if they can get someone to direct the offense, they have a good chance at winning the SEC West. Auburn won the SEC West in 2013 and has a good chance at winning it again. Senior quarterback Nick Marshall is a magician in the Gus Malzahn option offense, however, Marshall could be forced to miss some games due to a marijuana arrest. This will be Marshall’s second year in the offense and there should be no reason he can’t improve on his 2013 performance. In the SEC East, I believe it will come down to South Carolina and Georgia. South Carolina will have to replace quarterback Connor Shaw, but Dylan Thompson looked very good when Shaw was injured. Thompson is more of a drop back passer and gives the Gamecocks a different look. Running back Mike Davis could be a dark horse for the Heisman. South Carolina is also losing #1 overall draft choice Jadeveon Clowney on defense, but they still have a lot of talent on that side of the ball. Georgia is losing quarterback Aaron Murray but senior Hutson Mason looked good when Murray was injured last year. Heisman candidate Todd Gurley and receiver Malcolm Mitchell are both returning from injury and should add explosiveness to the offense. The Bulldogs defense returns a ton of talent and should be the strong suit of the team. Pac-12 – The Pac-12 is an improving conference top to bottom. The only question is will they beat each other up, preventing a team from being ranked high enough to make the playoffs? In the Pac-12 North, the top teams should be Oregon and Stanford. This is becoming quite a rivalry between these two schools. Stanford used to be better known more for their academic standards than their football team, but they have changed that. The Cardinal has become a tough, physical team loaded with talent. Quarterback Kevin Hogan is beginning his third year as the starter. He is 16-3 as a starter and is 10-1 against ranked teams. He is a smart, steady, athletic quarterback that manages the game well, but doesn’t really attack defenses. Hogan keeps his team in games and doesn’t make many mistakes. Stanford is known for their tough, pounding running game. The last two years, they could rely on one running back to handle over 300 carries, but this year, it looks like they may use more of a committee approach. The strength of this team over the years has been the defense and they are still loaded on that side of the ball. Stanford is one of the few defenses that can give Oregon fits. The Oregon Ducks are a fast, explosive team that can hang 50 points on you in a hurry. Quarterback Marcus Mariota is a leading Heisman candidate and should again be a huge part of both the passing and rushing attack. The Ducks offense is like basketball on grass and they can make you look silly really quickly. The big problem for them could be replacing long time defensive coordinator Nick Aliotti, but I think they have the talent to outscore most teams. In the Pac-12 South, it could come down to UCLA and USC. The UCLA Bruins have become a much more physical team under Jim Mora Jr and they have Heisman candidate Brett Hundley leading the offense. Hundley led the team in both passing and rushing last year. The Bruins really need to find a running back to shoulder some of the load running the football. Myles Jack was the Pac-12 Offensive and Defensive Player of the year, but I don’t see him as a full time running back. This team will go as far as Hundley leads them. Lane Kiffin is gone at USC and in comes Steve Sarkisian. Sarkisian will bring more of an up tempo attack to the Trojans. It will be interesting to see if quarterback Cody Kessler will thrive in this offense. Kessler had his moments last year and the team got hot at the end of the season. Kessler will have a good group of weapons to work with and I think the offense could really take off. Big-12 – The Big-12 is the only one of the Power Five conferences that does not have a championship game, but the Big-12 schools are quick to remind you that they are the only conference where every school plays every other school. Because of that, the Big-12 is always a tough conference to predict. Many people are on the Oklahoma bandwagon after they embarrassed Alabama in the Sugar Bowl. However, Alabama fans will quickly tell you that team did not want to be in that bowl. I tend to believe that and I will also hold off on the praise of quarterback Trevor Knight until he’s done it on a consistent basis. Knight carved up the Crimson Tide, but during the season he struggled with beating out Blake Bell, who is the passing equivalent of Tim Tebow. Bell has now moved to tight end and Knight has the position, so we’ll see how he does. The Sooners have some talent offensively, but it’s mostly young and unproven. ESPN has them ranked #3 in their power rankings, but I’m not buying it, at least not until I see more consistency from Knight. The Baylor Bears, on the other hand have Bryce Petty, a senior quarterback in his second year in the system. Petty threw for over 4,000 yards and 34 TD’s last year and should only be better with a year under his belt. Petty has a ton of returning weapons, including receivers Antwan Goodley and Levi Norwood. The Bears are moving into a new stadium and enthusiasm should be high on campus. I believe Baylor will recover from their loss to Central Florida in the Fiesta Bowl and will win the conference. ACC – This conference gave us our last BCS National Champion, the Florida State Seminoles. This broke a seven year string of SEC teams winning national championships. Florida State is clearly a favorite to repeat since Heisman trophy winner Jameis Winston returns at quarterback. Winston also has receiver Rashad Greene, tight end Nick O’Leary and running back Karlos Williams as weapons. This team is too talented and has a favorable schedule, so I believe they should make it back to the ACC Championship Game. Their two toughest games could be October 30th at Louisville and November 15th at Miami. I believe this team should be able to run the table straight to the ACC Championship Game and win the ACC Atlantic Division. If the Seminoles stumble, Clemson could take advantage. Sure, the Tigers have to replace Tajh Boyd, who was highly successful, but senior Cole Stoudt has looked good up to this point. If Stoudt can handle Chad Morris’ fast break offense efficiently, the Tigers could be a force in the ACC. The Tigers also have to replace all-everything receiver Sammy Watkins. I’m not sure they have any one person that can replace him, so Stoudt will likely need to distribute the ball all over the field, taking what the defense gives him. Since Dabo Swinney took over at Clemson the program has taken off and this year should be no different. In the ACC Coastal Divison, things could be up for grabs. Duke won that side of the ACC last year, but they will have a tough time making it to the ACC Championship Game in back to back seasons. The Miami Hurricanes will have to replace Stephen Morris at quarterback and may have to do so with a freshman QB. Right now they have 4 QB’s attempting to claim the position, including former BYU and Kansas QB Jake Heaps. Expect a decision to be made on this any day now. Whoever, gets the job will have Heisman candidate Duke Johnson to hand-off the ball too. Johnson is a powerful, explosive back that can take over a game. He will also have explosive wide receivers that include Phillip Dorsett. If they can get the QB position solidified, expect the Hurricanes to challenge for a spot in the ACC Championship Game. The Virginia Tech Hokies also have to determine a starting quarterback after Logan Thomas moved to the Arizona Cardinals. A possible candidate for the job is former Texas Tech quarterback Michael Brewer. The Hokies only return 3 offensive and 5 defensive starters, so they will need to mesh quickly if they want to win the ACC Coastal. Big Ten – The Big Ten is adding new members, Rutgers and Maryland and will realign their divisions and give them names that actually make sense. In the Big Ten East it will be interesting to see if Ohio State or Michigan State captures that side of the bracket. The November 8th game between the two teams could be the deciding factor. Braxton Miller will return for the 4th year as the starting quarterback for Ohio State. He is a punishing runner that has improved his passing skills every season. Miller rushed for over 1,000 yards and passed for over 2,000 yards in 2013. The Buckeyes lost running back Carlos Hyde to the NFL and will need to find someone to take the load off of Miller in the running game. The Buckeyes are loaded with talent and should contend for the Big Ten title. The Michigan State Spartans are a tough, physical team that surprised people by winning the Big Ten Championship and going to the Rose Bowl. First year starting quarterback Connor Cook did a good job managing the game and as the season progressed, he became a QB that could be depended on to make plays to win games, winning the MVP of the Big Ten Championship Game and the Rose Bowl. Running back Jeremy Langford, who rushed for over 1,400 yards also returns. The Spartans live and die with a physical defense that has the ability to shut down an opponent. They return 5 starters to that defense so the new players will need to get up to speed. In the newly formed Big Ten West, the Wisconsin Badgers seem to be the favorite. Running back Melvin Gordon is a speedster that is a candidate for the Heisman Trophy. He rushed for over 1,600 yards last year, while sharing the position with James White. The big question is how many carries can Gordon take? He wore down late in the year, despite sharing the job. Joel Stave is 13-6 as a starter, but he was injured in the Capital One Bowl, so he may not be ready for the first game. If not, former safety Tanner McEvoy could take over. McEvoy is more athletic and is the type of quarterback that coach Gary Anderson likes in his offense. The Badgers also only return 3 starters on defense, so that side of the ball will need to come together quickly. If Wisconsin isn’t able to win the East, look for a team like the Iowa Hawkeyes to capitalize. Iowa returns starters at quarterback (Jake Rudock), running back (Mark Weisman) and receiver (Kevonte Martin-Manley) and they have one of the best left tackles in the country (Brandon Scherff). The Hawkeyes also return 5 starters on defense and they host Wisconsin on November 22. Now that I have predicted the Power Five winners, that leaves four spots for five teams. If you aren’t in a Power Five conference, it will be tough to make it to the playoffs. It’s also possible for an independent to make it into the playoffs, but Notre Dame is the only team that seems to have a chance and they have a killer schedule. So which Power Five team gets left out? I think it could be the Baylor Bears. That would leave Alabama, Oregon, Florida State and Ohio State as your playoff teams. Of course, this early in the year, this is all truly speculation, but it’s been fun trying to come up with the four teams that will duke it out for the championship. What’s interesting is that most teams will now have to not only win their conference championship, but two more games in a row to win it all. That’s a tough thing to do to win three big games in a row. I can’t wait to see how it unfolds! If you like what you read, please like us on Facebook and recommend us to your friends. See you next Wednesday! This entry was posted on August 14, 2014 by draftmaniacs in Uncategorized and tagged ACC Football, Alabama football, Baylor football, Big Ten football, Big-12 football, College football, College football playoffs, Florida State Seminoles, NCAA football, Ohio State football, Oregon Ducks, Pac-12 football, SEC football.